Enjoy the warmth and beauty of solid Acacia hardwood outdoor furniture that you can enjoy year round. The STOCKHOLM 180 Dining Table is designed for backyard patios and decks. Dimensions are 71 inch x 39 inch x 28 inch . Made with acacia wood with water-resistant properties that makes it suitable for outdoor use in Canada. The 51 inch length x 51 inch width x 29 inch high tabletop makes a stunning focal point. Matches well with the complementary dining chairs: STOCKHOLM 5-Position Folding Armchair and SOLITAIRE Casino Folding Armchair. The STOCKHOLM 180 Dining Table is designed for modern backyard living. Tabletop dimensions 71" x 39" x 28". The PEX-369-T outdoor dining table from CorLiving welcomes back the days of Mission design, popularized in the Southwest during the early 20th century. The contemporary approach to this classic aesthetic is what sets this stylish outdoor table apart. From its clean lines to the emphasis on showcasing the wood grain. Treated to withstand the elements, this drop leaf hardwood table is umbrella compatible and can fold flat for easy storage in the off-season. 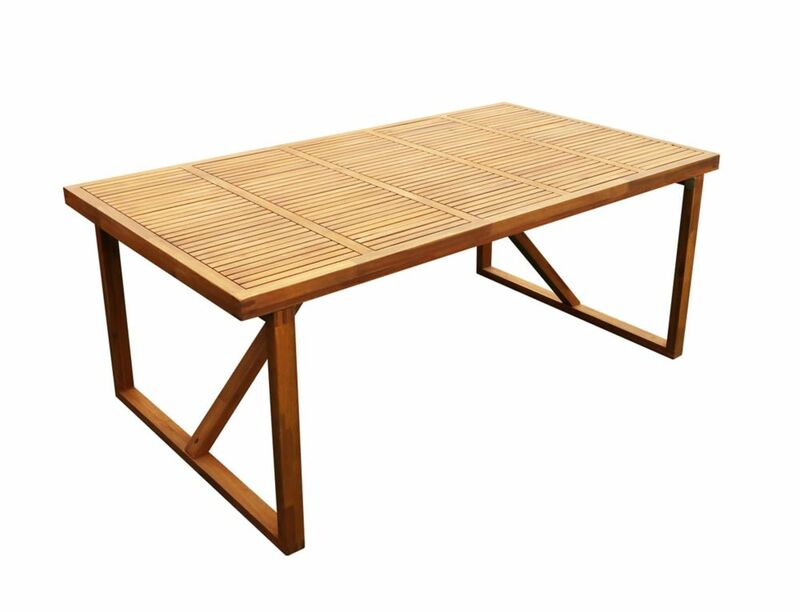 180 cm (71 inch x 39 inch) Table Alone Enjoy the warmth and beauty of solid Acacia hardwood outdoor furniture that you can enjoy year round. The STOCKHOLM 180 Dining Table is designed for backyard patios and decks. Dimensions are 71 inch x 39 inch x 28 inch . Made with acacia wood with water-resistant properties that makes it suitable for outdoor use in Canada. The 51 inch length x 51 inch width x 29 inch high tabletop makes a stunning focal point. Matches well with the complementary dining chairs: STOCKHOLM 5-Position Folding Armchair and SOLITAIRE Casino Folding Armchair. The STOCKHOLM 180 Dining Table is designed for modern backyard living.